Lobbydog hears that one of the Prime Minister’s press officers got in a flap last night during a conference call with Gordon and an Evening Post reporter. She disliked the reporter's constant questioning about Nottingham City Council’s questionable investments in Icelandic banks and had tried to intervene towards the end of the conversation. Unfortunately she left her phone on mute and her protestations went unheard by the reporter who continued to hammer away. Ashfield MP Geoff Hoon – the new transport secretary – says he’s not daunted by the challenges of his new job. And after some of the difficulties he’s had to deal with in the past why would he be? Ken noted: “He’s been pretty unlucky with some of the things he’s had come his way in the past. 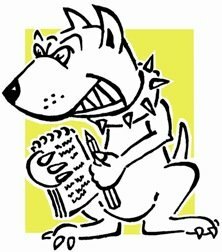 Lobbydog hears a rumour the Government are backtracking on proposals to pass over major planning powers to regional development agencies (RDAs). Only yesterday EMDA chair Bryan Jackson commented that a plan to hand RDAs power over the regional spatial strategy - which places major housing developments - seemed "illogical". Maybe the powers that be are starting to see his point of view. Harriet's response had gone on far too long by anyone's standards, even the eyes of those on the benches behind were starting to glaze. As it went on a low grumbling began that slowly increased in volume until someone finally broke and screamed "shut up!" It was most unparliamentary, but necessary. PMQs without the PM can be a let down at the best of times but with Ms Harman it's particularly heavy going. Hague performed reasonably well but the whole thing was too sluggish to call a winner. All of the subject matter was financial except for one bizarre question when a Labour MP asked Harriet to welcome a meeting of the European Space Committee. It set her up for a lame joke about a summit boldly going where no summit had previously gone. Harriet didn't mess up staying on message though - that the crisis is global and didn't grow from Number 10. But there was light relief when she responded to a question on interest rates saying; "I don't really know what he's talking about in terms of interest rates." A similarly ambiguous comment saw her pronouncing that the treasury did not "need any advice" from the likes of her. We knew what she meant, but it sounded stupid, and that's what matters in the circus. Tory website ConservativeHome had a briefing on Dave's strategy for tackling the Government on the financial crisis last night. It seems that the Blues are reconciled to Gord getting credit for saving the banks. They even admit they expect their polls lead to drop into single digits. They are supposedly going to wait until the buzz over his bank plan dies down and then concentrate their attacks on the economy as recession bites. They will hammer home the message that the economy's wider problems are deeply rooted in Gordon's policies over the last ten years. Giving the PM room to stand in the lime-light may be risky, you only need to look at PMQs from last week to see how such a strategy weakened Cameron. There will be those who feel the Tories should be going on the offensive. Scroll down to see the earlier post on Notts’ own big beast and his attack on Brown. The House of Commons just finished debating whether people should be allowed to keep monkeys as pets. Who says Parliament is losing its relevance. As if it wasn't odd enough in itself, the debate was put in terms of primates - which include humans. Big hitter Ken Clarke has become one of the first Tories to launch a proper broadside at the PM over his handling of the bank crisis. In an interview with the website e-politix he called Brown "pathetic" for claiming he was helping to solve the crisis when actually, says Ken, he was "panicked" into action. Regardless of its justification, it makes a change in tone to the "super-Gord" notes circulating in the national press. But it's also interesting in the context of Ken's touted return to the front bench. If moves are afoot it may be that Cameron's using Ken and his stature to try and rain on Gordon's parade - at very least he is acquiescent. Dave tried to gently tackle the PM on his performance last week but couldn't make it sit comfortably with his we'll-get-through-this-together stance. Lobbydog hears that Notts MP Patrick Mercer is soon to become a published fiction author. The Tory military expert from Newark has signed a three-book deal with publishers HarperCollins. He was just about to hand in the finished manuscript of his first offering for editing, when a technical error caused the last chapter of 8,000 words to be wiped from his computer - yet another innocent victim of data loss. Peter tried his hardest to remain solemn as he strode into the Lords just now to become "ennobled". The new business secretary, complete with ermine robes, was the height of decorum as he bowed his head on entrance to the chamber. But he just couldn't help a smug smile escape as he stood waiting to make his oath to the Queen - 'I'm back'. That it happen to be caught on film as a Lords official said the words "dignity and honour" is pure coincidence.